Looking for a Vapor/Dustless Blasting system. That is portable, easy to use and affordable. Check out all the EQp has to offer. The EQp is designed to remove graffiti, brick and patio cleaning, paint and stain removal from wood, steel, and concrete surface preparation. 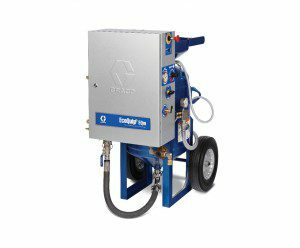 Works with coarse, fine or non-destructive blast media, yet emits up to 92% less dust than traditional dry blasting. With blast pressure up to 150 psi and up to 90 minutes between refills, the EQp will help any user complete jobs quickly and efficiently. Our Vapor/Dustless Blasters use A LOT LESS media and Hold Tight than the machines made in Texas, go faster, and do not need to be refilled as frequently – our machines may cost more up front (depending on size), but quickly give you a payback with media and labor savings, not to mention less waste and clean up time. Please contact us now for further information and pricing.